It’s my 42nd birthday today. I have no fancy plans. 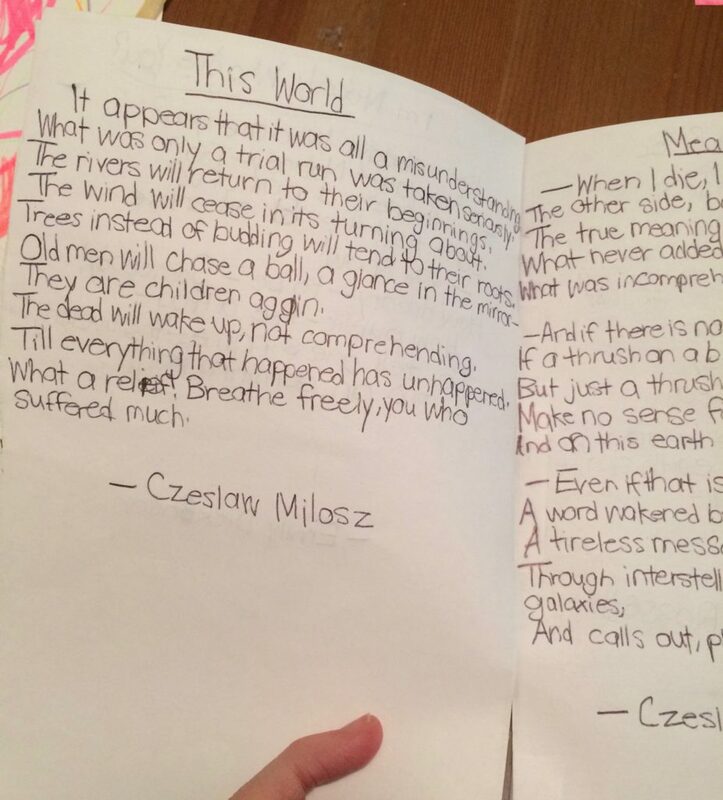 It’s not the cheeriest birthday poem, but I can’t help but think of W.S. Merwin’s poem, “The Anniversary of My Death” when I wake up. I always think of it as birthday’s twin. 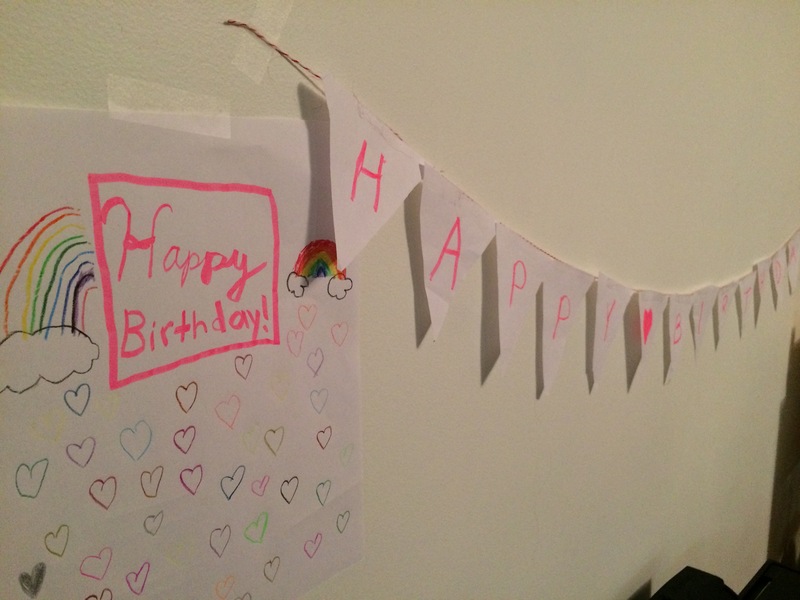 But then I was greeted by a little girl who jumped out of a hiding place as soon as I opened my bedroom door and surprised me with all kinds of beautiful homemade decorations and presents. I received my birthday wishes via email from every dentist and eye doctor I’ve ever visited. I also received wishes from a complex web of people on social media that include my late husband’s high school and college friends, bandmates, co-workers, as well as my own friends and family, and in recent years, lots of people I’ve never met in real life. Some are widows; we’ve shared private pains and virtually watched each others’ children grow up. Some are other writers. Some are readers and have become friends. “Poets are always taking the weather so personally. They’re always sticking their emotions in things that have no emotions,” said Salinger. I try to remember this when I realize it’s a cloudy, rainy day. Lackluster. Still, writing’s the best way I know how to deal with the dampness. So after I open up the array of wrapped presents my daughter has left on our dining table,— “You’re such a good receiver!” she says motioning me to try on the fluorescent hoop earrings she picked out for me at Claire’s—after I drop her off late at school so she can enjoy the fruit of all the birthday festivities she’s planned for me a little more leisurely—I head to the library. The library is one of the only places where I feel safe. The librarians know me there and say hello. I browse the new non-fiction section, standing there forcing my neck into a painful right angle, looking through row after row until I reach the end. “When you really think about it, the library is almost too good to be true,” Audrey had said to me one day about a month ago “I could just live in the resource section!” I smile thinking about this and sit down at one of the tables surrounded by dated knotty wooden shelves of books. Anne Lamott often writes a little reflection of what she knows on her birthday and sends it out into the world. It’s self-deprecating in her usual style and makes me laugh and smile and cry and keep reading. I have decided to do this also this year even though I’m certainly no Anne Lamott. I would like to think that buying my own grave plot beside my husband at 34 would’ve given me some insight into how to live in the present well. I would like to think that I enjoy simple pleasures and transcendent moments more than most, and I think I do. But I also struggle to get out of bed most mornings. “Today is a gift,” I say aloud when my feet hit the floor or as I raise the blinds. But life’s routines can become monotonous and I have negative pathways decades old burrowed deeply in my brain. “Today is a gift…” Time to pack lunch and make breakfast. A week or so ago, Audrey was bemoaning “growing up” as she has been doing lately. She is super aware of her growth and change and what the world will require of her. She is wishing to be a baby again and stay at home and play all day. “I wish I didn’t know about death…and cavities…” she is saying. I think upon entering middle age there is much the same wish. Things seem a lot harder. I have felt blindsided by all of the divorce, illness, and just plain bizarre tragedy. My friend’s mother who suffered a brain aneurism a few years ago was found by her husband on the bathroom floor with cuts on her mouth this week. “Praying” I text back after she tells me. I speak with a cousin who is divorced and commutes eight hours every two weeks to see his sons. He eats dinner most nights with his mother, my aunt, who is recovering from cancer treatments. It’s not the life he expected, but he tells me on the phone last weekend that he thinks it’s all about the way you look at things. He is still writing songs and trying new things like a yoga class he tells me he hated, and ride-shares to have company during the long ride. He is even playing jokes on the person riding with him by telling them he has sleep apnea and falls asleep at odd moments and then suddenly slumping over while he’s driving. I am laughing hysterically when he tells me this because it is funny and let’s face it, absolutely insane. I am shopping in Trader Joe’s when I overhear someone’s phone conversation (OK, I think writers eavesdrop a lot), “It’s just a quick surgery, a couple hours. I’ll be home the next day.” I wonder if he’s feigning nonchalance for someone else’s sake and think about how primitive “surgery” is—like cutting and pasting. But this seems to be the conversation now…ailments, taxes, hormones, sick parents, cutting and pasting. I would like to think that I am strong. This week I have, though, what I literally think qualifies as a nervous breakdown in the morning before taking my daughter to school. She is following me around complaining because I suggested she not wear the fingerless black lace gloves for her class presentation in front of the parents, but after days of various meltdowns and friend drama, I just wanted to have five minutes to get myself ready in the morning, and I finally lose it. She tells me I’ve scarred her for life. At a lunch with an old boss and friend yesterday who has three children in college, she tells me pretty much the same thing and assures me that despite what she thinks, my daughter will not be scarred for life. She also tells me about her mother who has gotten super forgetful and moved in with her sister. My friend asked her aunt repeatedly if she knew what she was in for because she knew her mother wouldn’t be able to show appreciation, and her aunt replied, “Every bad day has already been forgiven at the cross.” In the bakery where we were eating layered crepe cake for dessert, the music almost blocked out that sentence so I asked her to repeat it: “Every bad day has already been forgiven at the cross.” She treats me to the cake, so later as I’m heading back to Penn Station I put a ten dollar bill in the cup of a man in a wheelchair with only a stub for one leg. We make eye contact. No words. “Last night I couldn’t sleep I was so excited for your birthday!” Audrey had said this morning. “It’s almost like it was my birthday!” I feel this same empathy when I see people suffering. It is too much to bear almost, to walk past, or look away. Tim Keller often says something like, “We are much more sinful than we ever imagined, but much more loved than we ever dared hope.” I think life is much harder than I ever imagined when I was younger, but also much more awe-inspiring and mysterious than I can ever put into words. I would like to think that I have friends and family that help me and support me, literally and in prayer. I have hundreds of friends on social media right? But this isn’t meant to be one of those phony social media posts where I talk about “my dear friend so-and-so” and “my dearest sweet friend so-and-so.” There are many days I go without speaking to an adult. I don’t wish to burden new or old friendships with just the negative so I reserve that for my therapist. Man, sometimes I feel sorry for her when it’s been a few weeks and I have a lot to get out. I would like to think we are never forsaken and therefore never alone. But I also agree with Rilke that “precisely in the deepest and most important matters, we are unspeakably alone.” A mother whose daughter died of cancer and had a huge social media following posted last year about how it felt like everyone had walked her to the edge of an abyss, but then it was only she that had to go down. I am sure she is right. I would like to think I eat super well and take care of myself. Someone texted me back the other day and said, “Did I ever respond to this? In my mind I did!” Well, in my mind I walk 2 miles every day, but in reality it’s maybe 3 times a week. In my mind I make kale smoothies and flax seed power balls, but then there are also those damn Girl Scout cookies I shove in my mouth while I’m making dinner! I would like to think I am healthy and calm, but I also suffer with long bouts of hypochondria and generalized anxiety disorder. Did I always have that lump on my head? Is my heart beating faster than usual? There is way too much palpating going on and not the good kind. It is almost time to get my daughter from school and I want to wrap things up here. I think my hope is to put some raw honesty, not confessional, into the all-knowing cloud or blogosphere or flat earth- whichever you prefer. I have been seeing this Emerson essay called “Circles” in absolutely everything I read lately. My favorite line from it is: “The one thing which we seek with insatiable desire is to forget ourselves, to be surprised out of our propriety, to lose our sempiternal memory, and to do something without knowing how or why; in short, to draw a new circle.” I was telling Audrey that for me today is the start of a new year so it’s kind of like New Year’s Day. I’d like to think that I have gained some wisdom in my 42 years, but then I’d never say that because one who is wise wouldn’t call oneself wise right? I’d like to think that this year will be “the” year full of “blessings” and abundance, but the truth is I have no idea what it will hold. It is unknown to me. But I think it’s a chance to begin again, a chance to draw a new circle, to move forward into space and time without knowing how or why…much like the process of writing. I’d like to think that I’ll be more disciplined, more positive, and maybe take more risks and startle less easily. Maybe finally get rid of all the extra clutter I hide in my walk in closet. I’d like to think that all my bad days have been forgiven at the cross and that, despite the odd nervous breakdown, the cutting and pasting, hormones that are “sooooooo real,” death and even cavities, there is enough grace for each day. As I’m walking out of the library, I see an elderly couple pull into the handicap spot in front. The woman gets out but looks helpless staring at the step up to the curb. I stop and ask her if she needs help at exactly the same time that she says, “Can you help me?” She hands me her cane, her Lesport sac, and her plastic grocery bag of library books and takes my hand. Slowly we walk, step by step through the two front doors to the library desk. She tells me she falls a lot and thanks me, and I think but don’t say (I’m not sure why), “It’s my privilege,” because it is. I would like to think that every altruistic act is really done with no expectation of receiving anything in return, but the truth is, I have learned over the last seven plus years that what people need most is dignity. And dignity comes in feeling useful. I think that’s why Audrey enjoys doing things for my birthday so much. Kids are on the receiving end most of the time. I’ve been on the receiving end of a lot of “help” but to feel useful is extraordinary and as I leave her there in the library I feel like everything is actually going to be OK and life’s beauties overcome their hardships, at least momentarily. Anne Lamott likes to quote Ram Dass, “We’re all just walking each other home,” or I’d add, maybe to the library, which feels pretty close to me. After school we go to a cafe so I can finish writing this and treat myself to a good cup of coffee on my birthday. It’s grayer out than it was in the morning. From the cafe window I can see the steeple of the church where I got married. But I also see blooming spring trees that look like giant baby’s breath. Inside I have a warm cup of coffee and a little girl doing spirograph across from me. “It has so many layers,” I say when she shows me one of the more intricate ones. “Exactly,” she answers. Exactly. Then she adds, “Every minute you sit, the thinner your temporal lobe gets. Have you been sitting a lot lately?” Wait, what? I stretch my legs. Happy Birthday Julia! Wishing you lots of love, health and happiness. What Audrey did for you brought tears to my eyes. So precious. Sending hugs! Thanks D. Your wishes mean a lot to me! Thanks Beth, You will love his work! Enjoy. Beautiful Julia. Thank you for sharing your birthday musings with us. Thanks for reading, Dana. I hope your own writing project is going well. Happy birthday Julia. Long time reader (I have read every single blog post you’ve ever written, literally, back through the old “Dear Miss Audrey” blogs), first-time commenter. I think I’ve always been too intimidated to offer any of my words – yours display such beauty, grace and strength, mine will always seem inadequate in proximity. But now when I read your posts, it’s through the lens of new mommydom, having given birth to twin boys 9 months ago. And I just wish that I could parent them 1/5th as beautifully and well as you have Audrey, who seems so bright, kind, talented, compassionate and wise that it leaves me awestruck. Thank you for continuing to inspire me in so many ways. This meant so much to me, Maggie. Your words were not inadequate in any way. They will stay with me for a long time- esp. on days when I’m not feeling so full of beauty and grace and strength at all! (which are many) When I read it to Audrey she was shocked at what you said about her. She was open-mouthed, and then she said she couldn’t stop thinking about what you said about her. But my favorite part was what she said about your words…”Those words just made me feel so welcome in the world!” Thanks for reading and congrats on your twins! Happy birthday Julia! I can identify with some of your “birthday dampness” in the years past, as it is a strange sense of loneliness although there is no absence of good wishes. I appreciate your raw honesty as always but never without a search for truth and beauty and grace. Love Audrey’s excitement over your birthday and her thoughtful booklet. Cheers to a new circle! I feel the same about you, Debby! Oh my…Julia. I’ve just found your blog through a Modern Loss posting and feel blessed. I find myself reading slowly and with awe through your birthday post, and finding there one beautiful jewel after another. This is an entire book within a posting. How wonderful it is to “see” another person and through an act of kindness affirm that we are all in this together. With warmest regards and deep thanks. Thanks so much for reading and for your honest sharing. I love what you wrote about your grandmother and aunts “who soldiered on cooking, cleaning, church going in Sunday best, attending to their aging friends, opening stuck jars, meager incomes…” It’s just lovely and important. Thanks again for encouraging me with your words.